Regrettably due to increasing business and production costs we are having to remove our 30ml e-liquid bottles for the long running sale that they have been on. However we will be reducing the normal price from £9.99 to £7.99 (up from the sale price of £6.99). We will be keeping all other products at their existing prices and are absorbing most of the price increases into the business. Please accept our apologies for this and see below for a discount promotion for all current customers. We would like to offer all existing customers a 10% discount on all 30ml e-liquids for the next 2 months. Simply use coupon code “CE1030” on the checkout page to redeem the discount. We have now stocked replacement glass tanks for the Nautilus Mini Clearomizer. Along side a restock of the Nautilus, Nautilus Mini, 1.6 and 1.8ohm replacement heads we now offer replacement glass tanks in case you have broken or damaged your original. 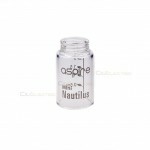 No need to buy a whole new Nautilus Mini, simply replace the glass! Why Is The CDC Lying About E-Cigarettes?